Part 1 in our series on Advancing your OD Practice explained how Organisational Development (OD) thinking and practice has evolved over the past 70 years to ensure it remains relevant and important in a VUCA world . It pointed out that, in the past, OD was the preserve of specialists. Yet, with increasing organisational complexity, more and more people are being involved in change and transformation work as part of their day job. So, developing an OD mindset, skillset and toolset is fast becoming an essential for all managers and professionals. And smart businesses are leveraging their change-ability by developing OD capabilities across their organisations. Over the past 70 years, OD has embraced diagnostic, dialogic and dynamic approaches to organisational change and development. But the use of the ‘self’ as the primary instument, remains a core foundation in OD practice. and it provides an entry-point for those who are new to OD to calibrate the strengths and skills that they bring to OD work from other areas of work and life. In this article (Part 2 of 3), we begin by exploring the 3 Ds in our framework and then invite you to think about how to get the balance right. Diagnostic OD began in a similar way to the scientific model and the project management approach. In other words, there was a linear process to start with: problem definition, then study the problem, determine options, select and implement the best option, and finally evaluate the effectiveness of your actions. This chronological approach has been effective for decades, especially when working on a specific change effort. For example, if an organisation requested support for its strategic plan, then OD consultants could offer strategic planning approaches that defined and studied the organisation, run workshops to determine strategic options, and finally support the implementation and measurement efforts. Within each of these steps, OD practitioners had opportunities to skilfully intervene with the human system in an effort to optimise organisational health and performance. Diagnostic OD was particularly effective at diagnosing “what was happening” inside an organisation. OD pratitioners not only stepped through the Diagnostic OD process, they noticed how groups were interacting with each other during each step of the process, and they often verbalised the most notable patterns. Diagnostic OD proved to be a unique way to review and improve behaviours inside an organisation. Dialogic OD uses conversation and dialogue to initiate change and improvements within an organisation. Dialogic OD is known for viewing organisations as meaning-making or sense-making systems. As opposed to thinking that reality is a singular objective fact within an organisation, Dialogic OD practices work to “reveal” multiple realities and perspectives. For example, OD practitioners often use the fishbowl exercise in a dialogic way. In one variation of this exercise, two concentric circles of chairs are placed in a room. The inner circle has a piece of paper taped to the back of each chair. Each piece of paper has a perspective written on it. If the fishbowl is discussing “onboarding at this organisation”, then one chair might say “CEO”, another chair might say “New Hire”, another chair might say “Information Technology”. The process involves the person sitting in the chair to speak from the perspective written on the back of the chair. The outer circle watches and listens to the inner circle conversation, and each individual has the opportunity to replace a person in any chair, then contributing more knowledge and perspective to the dialogue. From a Dialogic OD perspective, change isn’t necessarily linear and planned, it is mostly emergent and self-organising. This means that change can be encouraged as opposed to mandated. The emphasis is to shift mindsets, especially with positive psychology, so that the new mindsets will result in changed behaviours and organisational results. Dynamic OD understands organisations as complex adaptive systems. In this view, change is an ordinary part of everyday life and deliberate change efforts intertwine within a changing organisational landscape. So surprises are common and change itself seems increasingly fluid. As the name suggests, Dynamic OD is concerned with the dynamics of change – i.e. changing – and learning from change to inform action. Dynamic OD is concerned with working with energy for change: change practices focus on social movements, viral change, informal coalitions, social networks, collaboration and more. Rather than large programmes, Dynamic OD builds momentum iteratively through experimentation. In a VUCA world, taking action is the only way to truly understand how that action will land. But that does not mean that anything goes. Data is critical, but Dynamic OD uses data in a different way to Diagnostic OD. The emphasis here is on noticing what is changing. Rather than taking a detailed snapshot of the ‘As Is’ situation, which effectively freezes it in time, Dynamic OD is concerned with gathering real-time data about what is changing. Think about it as time-lapse photography. Dynamic OD actively invites multiple perspectives to gain insight into the dynamic complexity of organisational life. Inviting diverse views is critical, because any one person, or group, only has a partial view of what is going on. Echo chambers are as common in organisations, as they are in the wider world . This focus on multiple, diverse voices has much in common with Dialogic OD. But there is an incredibly important difference. Dialogic OD works to reveal multiple realities, whereas Dynamic OD is concerned with learning from multiple perspectives embedded in a complex reality . Good OD has a blend of all three approaches. Without data, OD is ungrounded. Without dialogue, OD is imposed. And without dynamism, OD is irrelevant. Good OD practitioners don’t just pick their favourite approach and apply it to everything. They observe the current balance of diagnosis, dialogue and dynamism in their organisation; and they consider what it needs to move forward. Like magpies , OD practitioners draw from a range of theories, approaches and techniques in order to work with complex challenges. They take time to understand the context they are working in, they discover what the system needs from them, and they choose what to dial up or down. Diagnosis overdone: Diagnostic tools and approaches can surface valuable data to inform dialogue and action. But many of us have come across organisations that overplay the diagnostic approach; where the fear factor of getting it wrong is high; and where those in charge won’t move without data – the more numeric the better. They can easily get stuck in a loop of tools that privilege experts (and often come with the badge of a big consulting firm), but which do nothing to change the underlying dynamics of the organisation. Dialogue overdone: Think about an organisation that is very comfortable with dialogue. If it is overplayed, the organisation can get stuck in a cycle of talk. They may need help to move into action with more dynamic approaches to OD which harness energy and amplify momentum. Dynamism overdone: Or, what about an organisation that is suffering from agilitis (an extreme inflamation of agility!). Being excessively changeable can undermine longer-term learning. In this scenario, thinking fast  may not be your best solution. Instead you may need to help slow down thinking with diagnostics that take in a broader range of data. An organisation suffering from agilitis is just as stuck in a repeating pattern as those suffering from analysis-paralysis, or all-talk-no-action. In this paper, we have explored the 3Ds in our framework. We’ve taken a position that good OD practitioners are skilled in finding the right balance; dialing different approaches up or down, as needed. 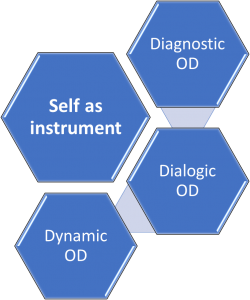 In Part 3, we consider how good OD practice uses ‘self’ as the key instrument. – Part 3: Self as an instrument for OD – coming soon. Dr Sharon Varney and John Hovell lead The Henley Forum’s Advancing your OD Practice programme at Henley Business School. The programme is unique (we believe) in bringing together people from different fields. Some have considerable OD experience and are looking to extend their practice. Others bring valuable expertise and life experience from other domains, and are taking their first steps in the OD world. That diversity creates a rich learning experience. The next programme takes place on 22-23 January 2019 at Henley Business School. Book by 30 November for the best price. Nobel Laureate, Daniel Kahneman, explains why fast thinking (habit) may get you into trouble in a changing world: KAHNEMAN, D. 2012. Thinking, Fast and Slow, Penguin Books.